A friend's daughter (have always treated her like my own) is getting married and asked if I would make her a gift box to hold her wedding cards. Needless to say ... I was honored. Her colors are purple and silver. I found the box in Big Lots (a store in Texas where we winter) and decided it was perfect for the project. I covered it in Silver tissue paper and then started decorating it. The Daughter and fiance have a standing joke about flamingos - so used those around the box on the bottom. I found them on napkins at a party shop. 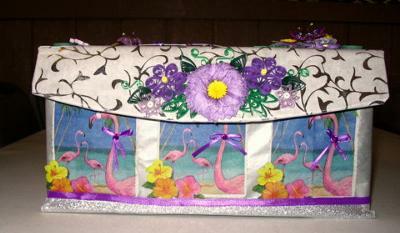 I bordered them with purple ribbon and put a ribbon bow with bling on one flamingo in each one. 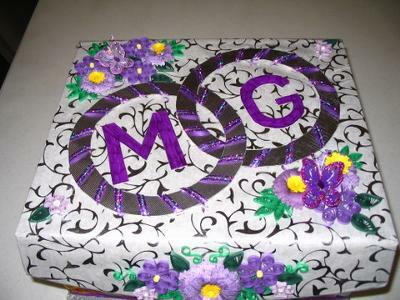 For the top of the box and the front flap I did quilled flowers in purples, some leaves and butterfly ($$ store purchase). I made 2 rings in silver and wrapped them with purple ribbon (another $$ store item) and mounted them on the top of the box. Then I did each of their first initials and put one inside each ring. It took me about a week and a half to make working approximately 4 hrs a day. What a fabulous project and the box is a "Keepsake" in it's own right... and something that I am sure will be treasured for many years to come. The colours are very vibrant and knowing what the intended recipient likes is always a big help when you start a card or a project loke this one.